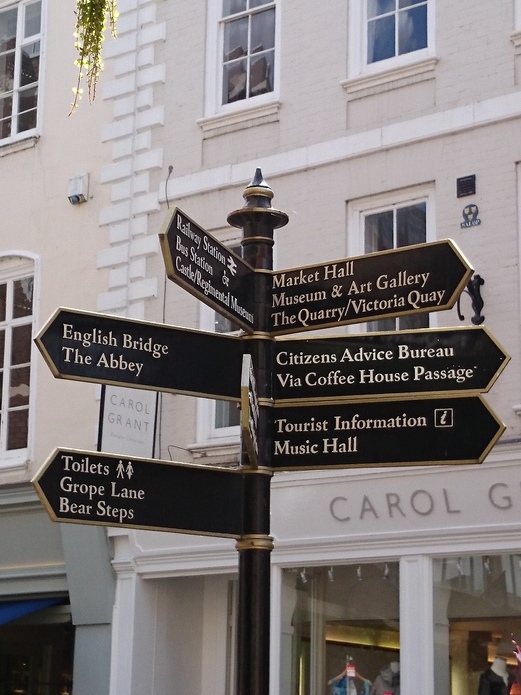 The best thing about living in Shrewsbury is that there is a lot of history here. 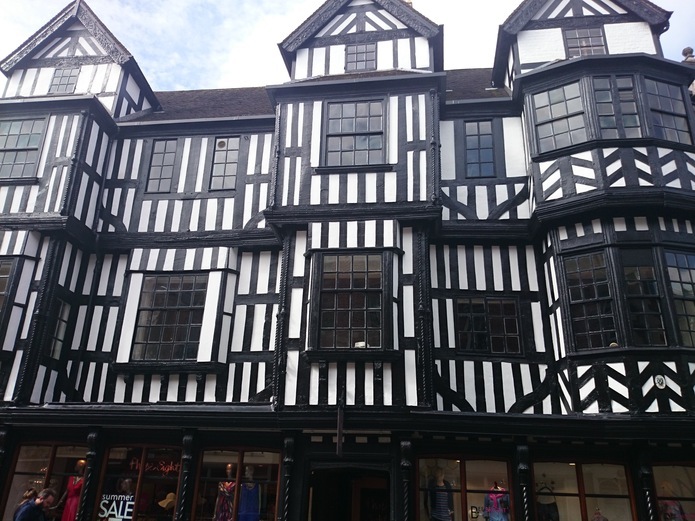 From Shrewsbury castle to the Tudor buildings that are still seen today. 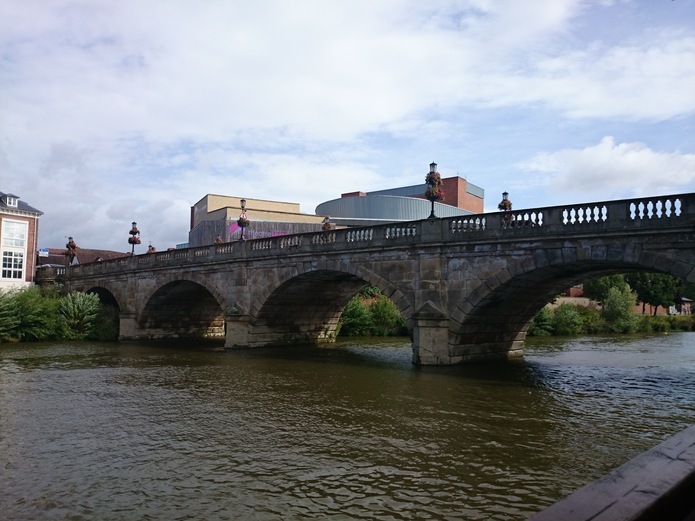 Shrewsbury is on the bend of the River Severn and has some lovely bridges; The English Bridge, The Welsh Bridge and Port Hill Bridge. Shrewsbury is also the birthplace of Charles Darwin and also where ‘A Christmas Carol (1984)’ was shot. . . . Love that film! There are lovely churches as well as fantastic galleries to check out. There is always something to do here. 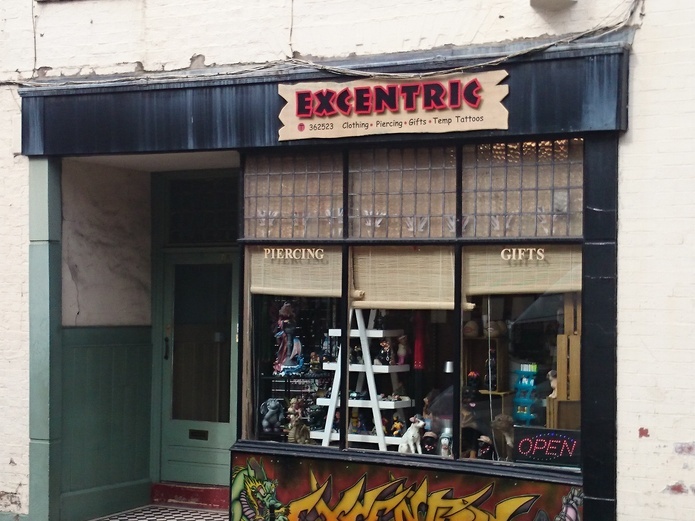 My favourite shop is Excentric Gifts [7 Dogpole]. You always feel welcome by the owners and staff members and there is always a happy atmosphere. I personally only go there for my piercing and tattoo’s but they do sell quirky and alternative gifts like Dragon / Faerie ornaments, key rings, jewellery or a large E.T / movie themed figures for all types of people for any occasion whether it’s for a birthday or for Christmas. I don’t buy my craft supplies from town; I tend to buy them closer to where I live. There is Anca [Radbrook Fish & Chip Shop, Bank Farm Rd] in the Radbrook area; it supplies wools and knitting supplies, fabric (Jellyrolls / Fat Quarters), sewing machines and haberdashery. It’s just off the main co-op with friendly helpful people that love to give advice if you’re stuck on making anything. I mainly buy my supplies from Percy Thrower's Garden & Leisure [Oteley Rd]. Percy Throwers was opened in 1969 by Percy Thrower who is described as 'Britain's first celebrity gardener'. He became a regular fixture on television and radio from the 1950s through to the 1980s, including the BBC series Gardener's World and Blue Peter. Percy Throwers have lovely flowers and gardening products to help any green thumbed person, they have a food section with jams, sweets and dried fruit and nuts. I buy all my budgie stuff from the pet section, from seeds to toys; it’s also where I bought my budgie from. 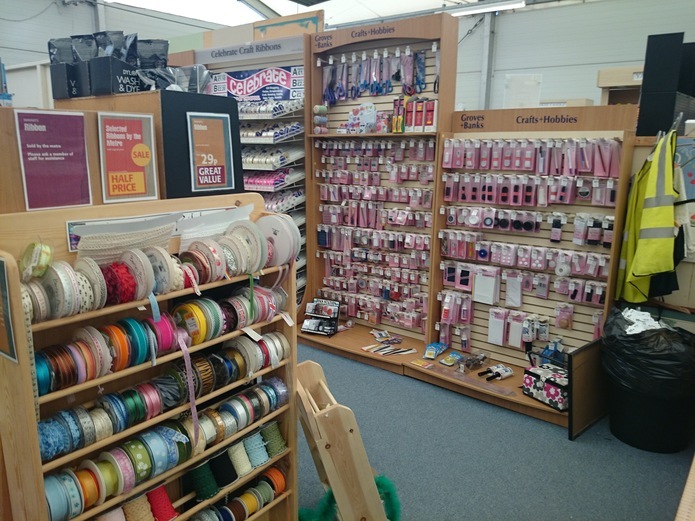 The Arts and crafts section sells everything you need whether or not you’re a knitter, card maker or a painter. All products are reasonably priced; I love the sale section next to the arts and craft section because you never know what you will find. And if you don’t fancy doing shopping they have a lovely little café for hot drinks and cakes. 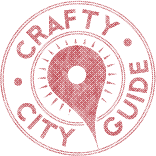 Every crafter loves to sell their items and there are a few places in the town you can sell them as well as just out of the town. I visit Wem farmers marketl [28 - 32 High Street, Wem] on a Thursday and in the town hall they have a small gallery space for artists as well as show cases for craft makers. For you to get your creations here you do have to talk to the staff but they are very helpful, you could also discuss having an indoor stall on the Farmers Market days (Thursday or Saturday). In Shrewsbury there is The Market Hall [Claremont St]l on Claremont Street, you can rent a stall to sell your creations (better for Shrewsbury residents) you can do this by going to http://www.markethallshrewsbury.co.uk/rent-a-stall. 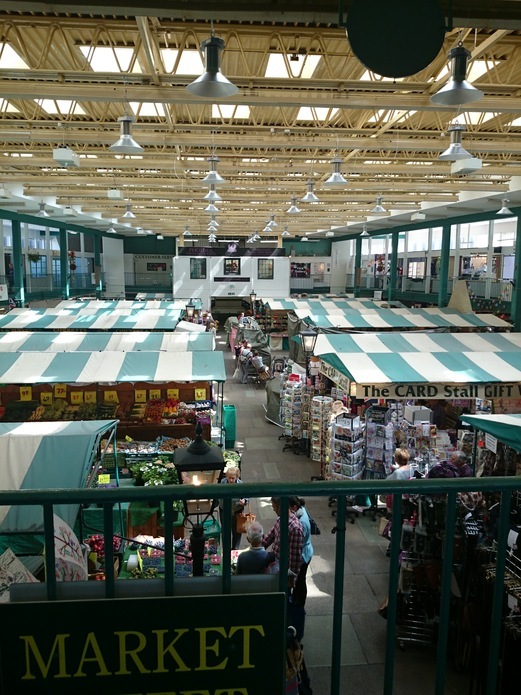 Other places you can showcase to sell your creations or a stall is Shrewsbury Museum and Art Gallery, Visual Art Network (VAN) in the Market Hall (must be a member) and Shrewsbury Farmers Market. 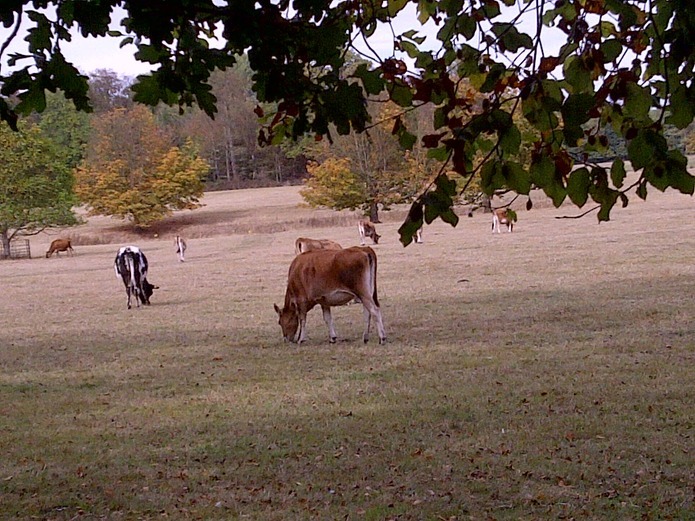 For painters, gardeners or anyone who loves drawing or wildlife there is great inspiration at Attingham Park [Atcham]. I went a couple of years ago to see an exhibition called ‘House of Beasts’ which is the largest contemporary art project in the National Trust. I absolutely loved going to this 18th-century mansion and estate which was built for the first Lord Berwick in 1785. Why not go on a tour of the mansion visiting the many rooms and seeing many pieces of art work (tours are daily at 10:30am – 12:30pm). If art is not your cup of tea then why not take a look at the Walled Garden, a green thumb heaven. The Walled Garden [National Cycle Route 45] is a space to relax and unwind among the flowers, fruits and vegetables grown to supply the mansion whether its flowers in the mansion or produce in the shop. If wildlife is your thing then you can see Cattle, Birds, and Trees, ponds and rivers or even the Deer Park (best seen in the winter where they feed the deer at 2pm every day). You can even walk your dog here (go to http://www.nationaltrust.org.uk/attingham-park/dog-walking/ to check out their policy). The top non-craft related attractions we have are all the festivals we have here throughout the year. Personally I haven’t been to any of the festivals we have as the tickets sell really fast but I hopefully will one day as people have told me how good they are. 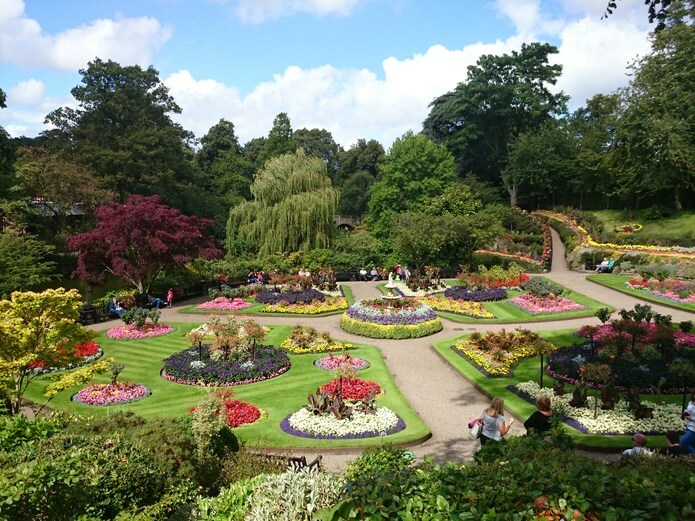 The festivals we have are; Shrewsbury Folk Festival, Shrewsbury Fields Forever, Shrewsbury International Street Theatre Festival (in the town), Shrewsbury Flower Show, Shrewsbury International Cartoon Festival and the Shrewsbury Food Festival. Some of these festivals you need to pay for a ticket but the Forever, Shrewsbury International Street Theatre Festival and the Shrewsbury International Cartoon Festival is free as they are on the streets of Shrewsbury Town. There are places all over Shrewsbury town where you can take photos but I like to take a ride on the Sabrina Boat [Victoria House Victoria Quay, Victoria Ave] Ride and take gorgeous photos on the River Severn. You can either order your ticket in advance for a group outing or buy a ticket while on the boat. They offer snacks and refreshments on this 45 minute ride, as well as live commentary while cruising the river. You will see St Chads Church, Shrewsbury Abbey, Theatre Severn and much more. It’s even better when the weather is good but does have shelter on the boat for any weather and you don’t know who you meet on the boat. 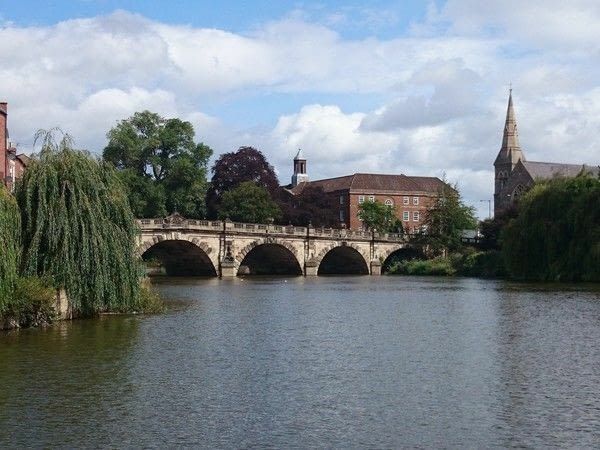 When I went on the boat ride, I got chatting to an elderly couple who were just in Shrewsbury for a day. They very much enjoyed the boat ride as well as what Shrewsbury offers. Another place is The Dingle in The Quarry  which was looked after by Percy Thrower when he was alive. It’s a lovely relaxing tranquil landscaped garden where you can sit and eat your lunch or take lovely photos of the flowers and small waterfall that resides there. I have been to a few places for lunch but the two I like is The Bellstone and The Oxon Priory. The Bellstone [Bellstone] has recently been refurbished to cater for your every need from just cake and coffee to somewhere to stay for the night it also has disabled access to the side entrance. I recently went there for my graduation celebration with my family and absolutely loved the gourmet food they served and the waitress that served us was very friendly and loved to please. My other place is The Oxon Priory [Shelton Corner, Welshpool Rd], a very friendly and family oriented pub with great food cooked exactly the way you want it. They have a play area for children as well as a beer garden for those who want to enjoy the weather outside. I always order the steak when I go there because for me they cook it perfectly. The most I have tried is the 14oz steak but they have just brought back the 20oz* Megasaurus steak on the menu, which I am yet to try. 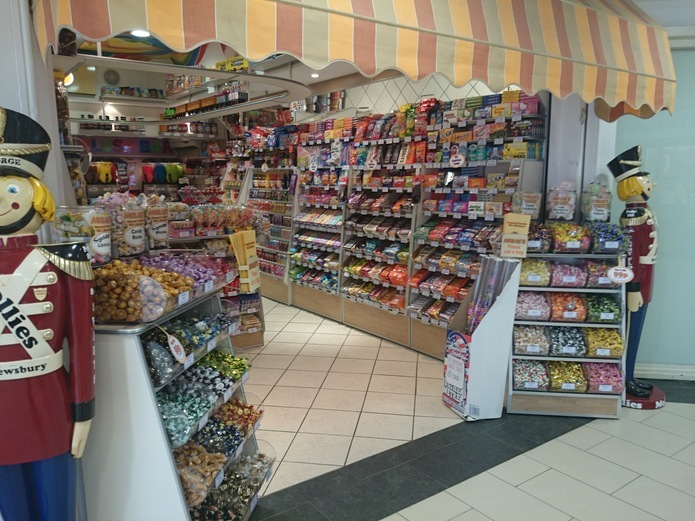 My favourite shop for grabbing a sweet treat is Mollies Sweet Shop [Pride Hill Mall, Pride Hill Centre]. I stumbled across this divine sweet shop looking for my childhood sweets Jolly Ranchers. They have everything from pick ‘n’ mix sweets to giant lollies on a stick. You may also find candy that are not sold in the UK very much like Lucky Charms (cereal) or Hershey bars. Please be warned though, if you have a very sweet tooth you will be in sweetie heaven. There are two places where you can meet and make friends with Arty / Crafty friends and they are The Gateway and The Hive. The Gateway [The Gateway House, Castle St, Council House Court] actually hosts courses, training, presentations, meetings and conferences in their many rooms but they do have a nice coffee shop where you can sit eat and craft and gallery where you can meet new people. The Hive [5 Belmont] varies from cinema to live theatre, open mics through to wrestling, plus world-class jazz and folk concerts. It’s a great place for children and young people to meet and try new things; this could be music, dance, animation, film-making, theatre, crafts or visual arts. I find that the Shrewsbury Library [1A Castle Gates] is a quirky and odd site to visit because it used to be a school which has been transformed into the library. The thing I find quirky about it is when you go inside you can see the historic beams in the ceiling, but if you go up the spiral stair case into the arts and crafts book room and look at the wooden panels under the windows you will see carved names. These names were carved in when it used to be Shrewsbury School, the school in which Charles Darwin attended as a child. 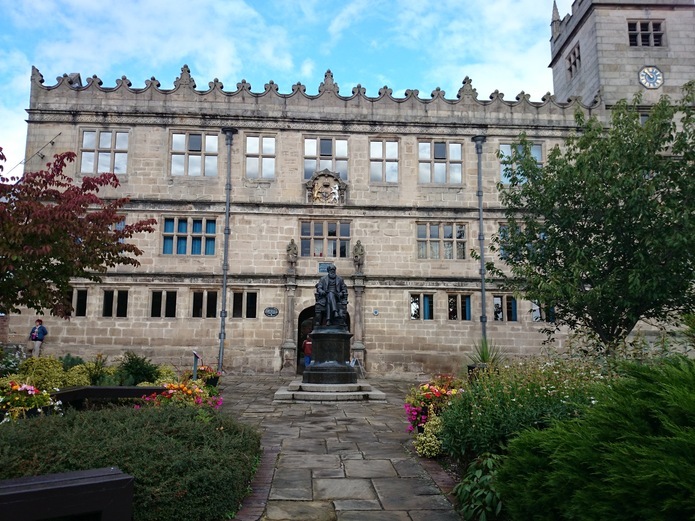 I also find the Shrewsbury Ghost Walk a quirky thing to do, the spooky and ghostly guided walks take place during October and November and they cover most of Shrewsbury town talking about Ghostly sightings and the history. Brilliant if you like to give yourself a scare. 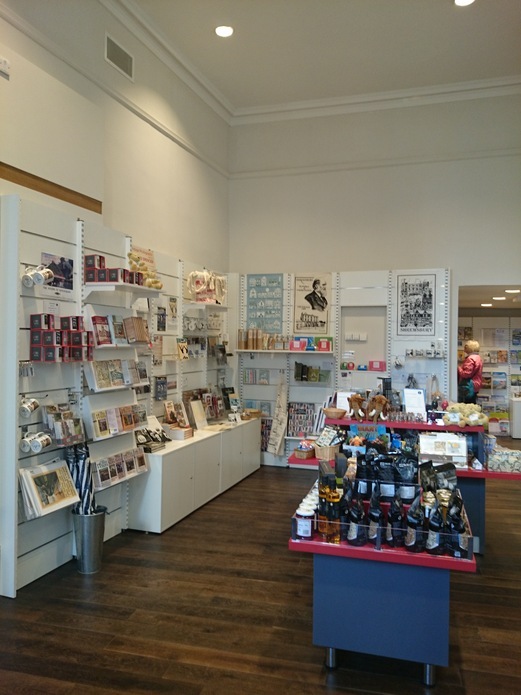 There are plenty of card shops that sell little souvenirs but I feel that Shrewsbury Museum and Art Gallery [Market St] has the best gift shop that are Shrewsbury themed from maps to stationary or postcards, there is anything there that you can buy to remember your time in Shrewsbury. You should take a look around there if you are into history whether it’s about the romans or want to learn about Charles Darwin. Downstairs is free to look around; there is a coffee shop, Roman exhibition and the gift shop. The upstairs you have to pay to see but is well worth the money (to buy a ticket you must go to gift shop to get it); there is the Charles Darwin exhibition, the Tudor Gallery, Medieval Gallery, Stuart Galley and the community and temporary exhibition. I love Shrewsbury. My husband and I ventured upon it while honeymooning in England, Ireland and Wales! We were particularly thrilled to come upon the church where St. Winifred was buried and we discovered the Abbey where we participated in a "Brother Cadfael" mystery tour! Great memories and the people there were so pleasant and kind!